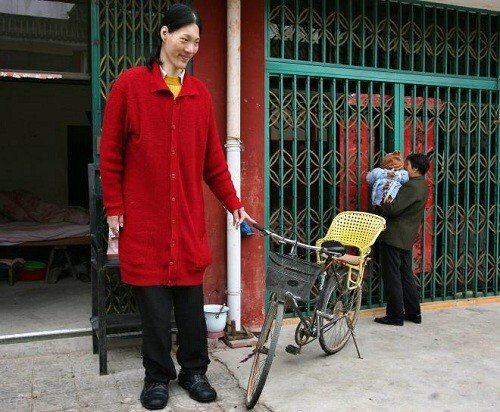 Yao Defen, the world’s tallest woman, who measured a gigantic 7ft 8in (2.36 m), passed away last month aged just 40. At her peak, Yao Defen also weighed over 434 lbs (200 kg) and had size 26 ft.
Yao Defen reportedly died on the morning of November 13 in her hometown of Zhucheng, eastern China. Born in 1972, Yao Defen developed gigantism due to a tumor on her pituitary gland. By the age of 15, she stood at over two metres tall. While playing for her school’s basketball team, Yao Defen fainted on court and had to undergo a medical examination. Doctors then discovered the tumor, which was releasing too much growth hormone and causing excessive growth in her bones. Yao Defen, the world’s tallest woman, was 10 cm taller than massive NBC Chinese basketball player Yao Ming. In 2006, it was removed and Yao Defen finally stopped growing. The tumor returned the following year but her family couldn’t afford further surgery. A neighbor recalled how on the morning of Yao Defen’s death, her widowed mother came running out of the family house. The woman, named only as Zhang, reportedly said: “It was 9 a.m. in the morning, just after breakfast, when her mother shouted that the girl was hurt. “People immediately rushed over to their home. I saw Yao lying on the bed – she wasn’t breathing.